The Old Fortress (Palaio Frourio in Greek) looms before you as you stroll down Spianada Square, reminding visitors of the many sieges Corfu withstood and the crucial role it played in the Mediterranean’s military defenses. Approaching it is like stepping back into the Middle Ages, as you’ll have to cross an iron bridge draped over a deep moat called the Contra Fossa to enter the 15th Century fortress. Once inside the fortress, explore a range of well-preserved sites, including two pentagon-shaped bastions (Martinego and Savorgnan), a beautiful gate (called Soranza) at the end of a cobblestone path, the fortress’ original heavy wooden door, an additional dry-moat, and the British barracks. The interior of the Old Fortress can be fully visited so make it a point to find the Tower of Land which affords you beautiful sea views, as well as the 19th Century British-built Church of St. George which resembles an Ancient Greek temple. 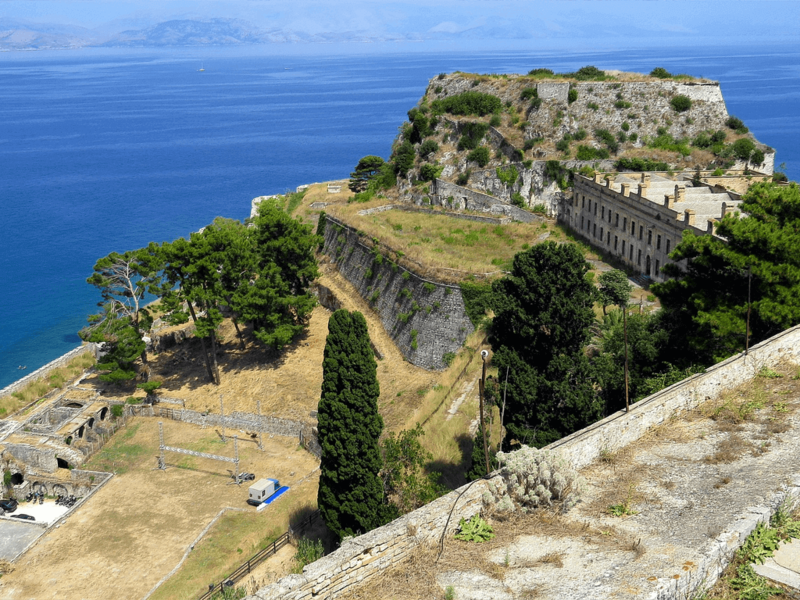 Corfu’s Venetian Old Fortress embraces the island’s cultural activities as it houses the Public Library, the Byzantine Collection and the region’s official archives. Concerts and art exhibitions are often held here, and within the fortress you’ll also find a restaurant and a gift shop.